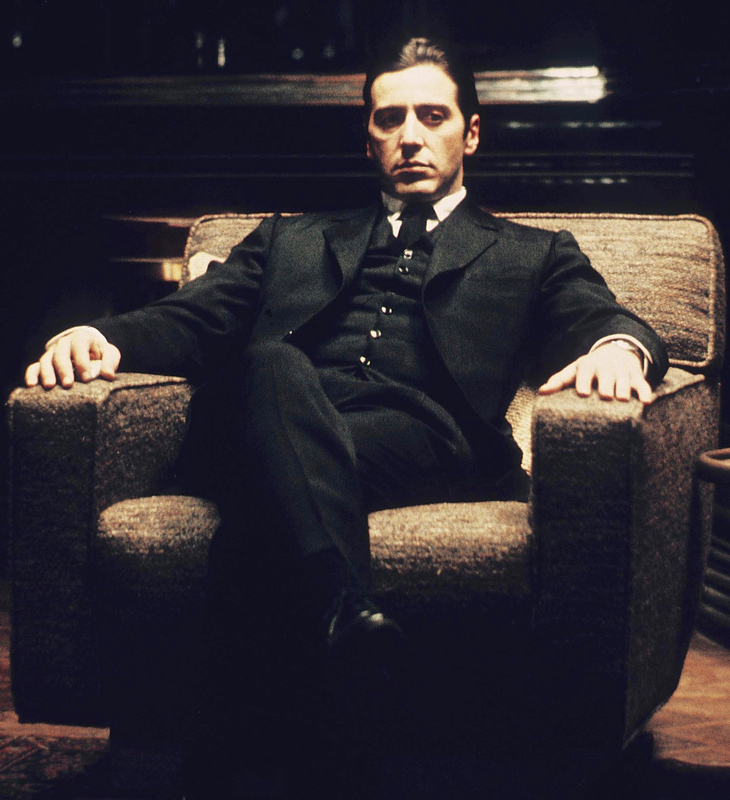 For #MafiaMonday, I’m exploring Michael Corleone at his most iconic, coldly receiving his siblings and family while holding court at his mother’s funeral. 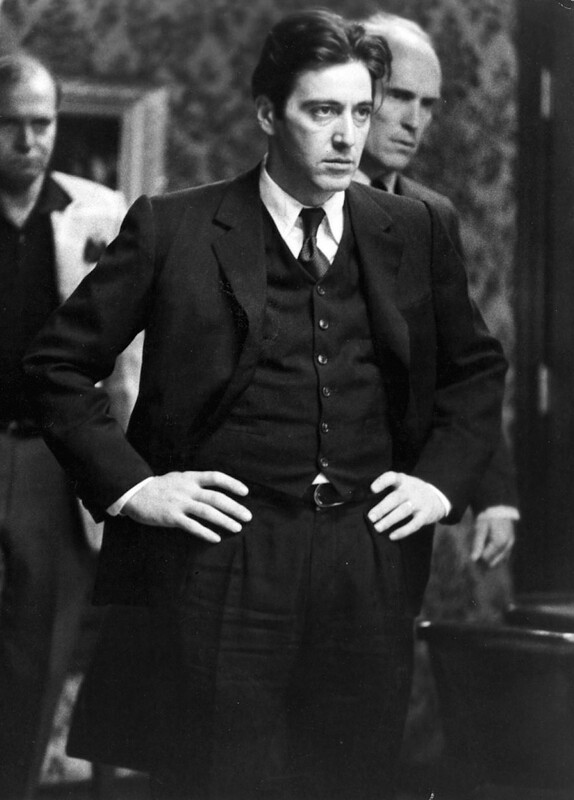 Michael Corleone wears this black three-piece suit custom-made for the production by Western Costume Co. for much of The Godfather Part II. Based on the suiting’s distinctive sheen and its varying degrees of reflecting different light, the material is likely a mohair and wool blend. Mohair was a common element of 1950s and 1960s suits, popular for its lustrous properties and practical comfort in warm weather, and it adds more depth to Michael’s suit than a standard black wool suit. 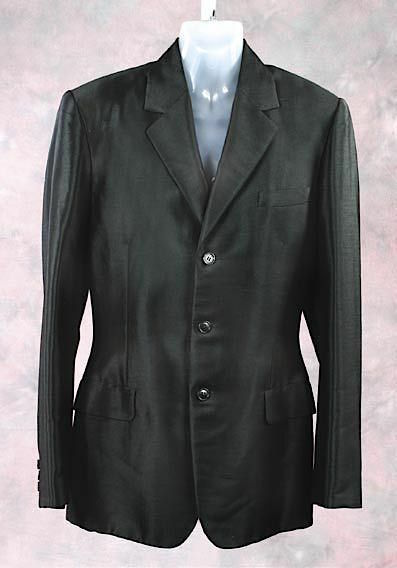 Michael’s black mohair suit jacket is single-breasted with notch lapels that roll to the top of a three-button front. The jacket is shaped by darts and gently suppressed through the waist. The shoulders are padded and the sleeveheads are strongly roped, adding structure and strength to Michael’s silhouette. The jacket also has a welted breast pocket, straight flapped hip pockets on the same axis as the lowest button, and three-button cuffs. It has been auctioned several times throughout the decades, and this online listing from Nate D. Sanders’s 2012 auction offers a description as well as an additional photo. The waistcoat (or vest) is high-fastening with a single-breasted, six-button front that Michael typically wears with all buttons fastened. There are four welt pockets and the back is finished in black satin to match the suit jacket lining. The trousers have double forward pleats on each side of the fly with belt loops, side pockets, and turn-ups (cuffs) on the bottom. The trouser rise is a little too low, allowing the black leather belt and sometimes even a triangle of Michael’s white shirt and tie to peek through under the waistcoat. This is one of the reasons men tend to wear suspenders with a three-piece suit as they keep the trousers from riding down at the waist, simultaneously covering the shirt and tie and maintaining clean lines. 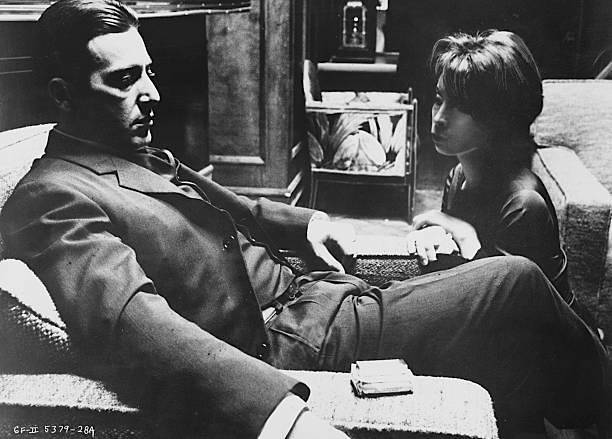 Promotional photo of Al Pacino and Talia Shire as Michael and Connie Corleone, respectively. Note Michael’s deck of unfiltered Camels on the right arm of his chair. Michael’s white cotton poplin shirt provides a stark contrast to the black suit. His shirt has a long point collar, consistent both with late 1950s fashion and the sharp collars often associated with gangsters, as well as a front placket and single-button rounded cuffs. 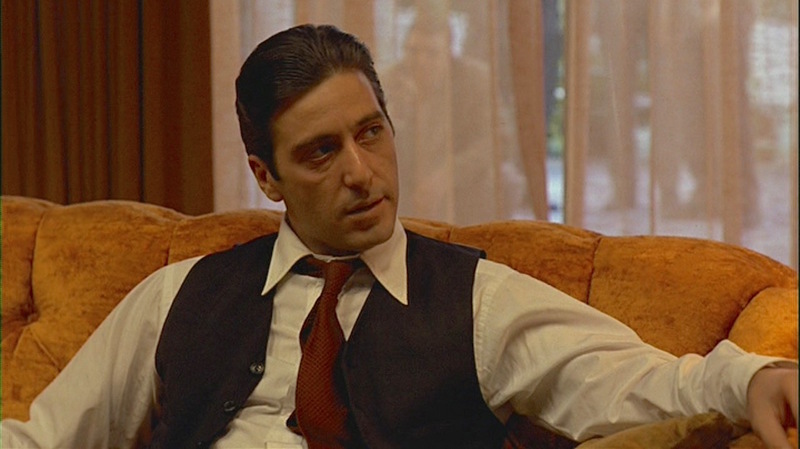 The only color Michael injects into this outfit comes from his crimson red textured silk tie, worn when Michael confronts Frankie Pentangeli at his family’s estate and upon returning to Las Vegas in January 1959 after his disastrous New Year’s Eve in Havana. Michael loosens up when he returns to his Las Vegas headquarters at the Desert Inn. For his mother’s funeral later in 1959, Michael wears the same solid black tie that he wore in Havana for New Year’s Eve. The monochromatic look of Michael draped in all black with just a hint of frosty white from his shirt communicates the character’s increasingly cold heart. His decision to embrace his brother Fredo is warmly welcomed by the family, but our black-suited protagonist’s frosty glare and the obvious pragmatism that went into his decision tells the audience that this isn’t personal, it’s business. 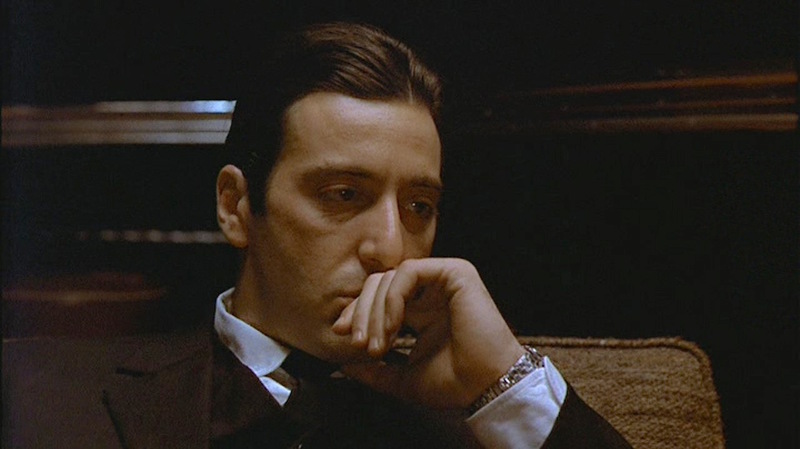 Michael appears to have at least two wristwatches in The Godfather Part II, a yellow gold watch (speculated to be an Omega Constellation) and a silver-toned watch with a plain white dial that he appears to be wearing here, based on the steel bracelet. His only other piece of jewelry is the plain gold wedding ring on his left hand. These scenes are generally set during the winter, so Michael’s return to Long Island finds him wearing several topcoats to add a layer of warmth when trudging through the New York snow. 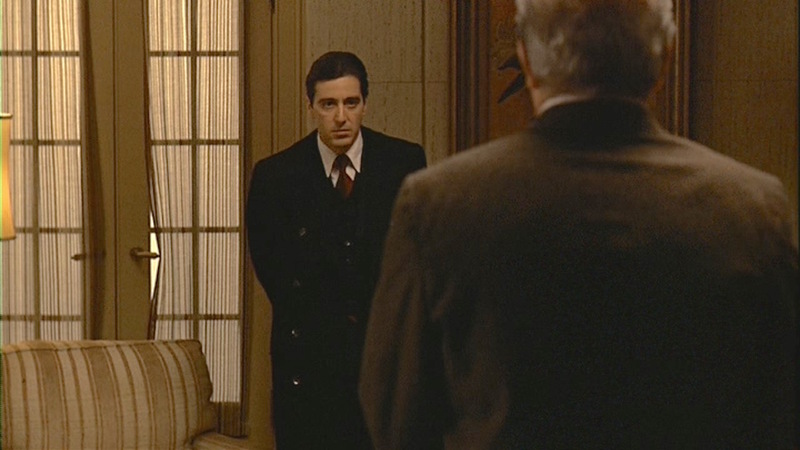 He is all power and intimidation when he meets with Frankie Pentangeli wearing a black wool greatcoat, draped over his black suit like a surcote, with its 8×4-button double-breasted front, wide Ulster collar, and button-tab cuffs. Michael sees less need to look powerful for his quiet return home to Lake Tahoe later in the movie, wearing a taupe gabardine raincoat with raglan sleeves, a long single vent, and a four-button covered-fly front. An understated ritornare a casa. Michael’s black fedora is the obvious headgear for our gangster with a short brim keeping in fashion with the late 1950s trends. A wintry walk through Lake Tahoe. Black footwear is the only way to go with a solid black suit. Michael wears black calf derby shoes with black socks. 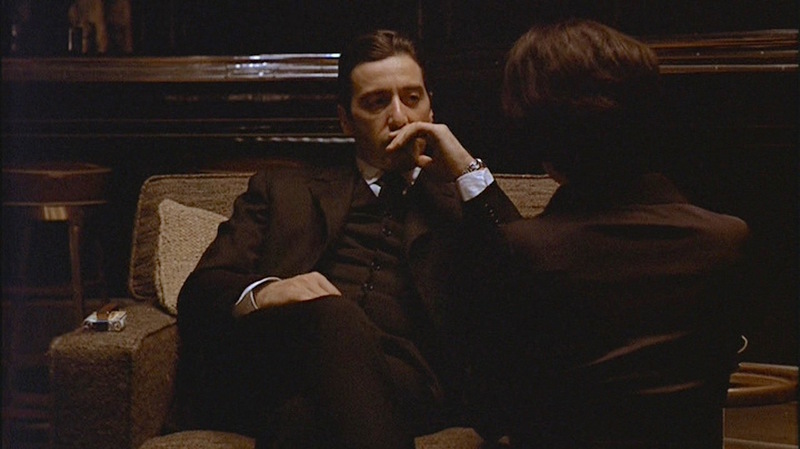 Michael Corleone may look cool in a black suit, but keep in mind that a) he’s a mob boss, and b) half of the time he spends wearing it is appropriately at a funeral (with a black tie, rather than red). Check out this handy flowchart from Primer before determining if you really need to add a black suit to your closet. My father taught me many things here; he taught me in this room. He taught me: keep your friends close, but your enemies closer. Hi Nick, I believe Michael’s gold watch is a vintage Omega. Not sure what the sliver watch is, but could be an Omega too. This is awesome. I was just watching clips of the Moe Green scene on youtube and thought, I want that suit – and then I came across this. Posted less than a week ago! Sir , another auction site lists this suit material as ” Black Shantung “. That would indicate that the suit is black Shantung Silk . It makes sense , if you think about it. When the senator admonishes Michael in Lake Tahoe for wearing ” silk suits ” , it would indicate that Michael has a penchant for wearing silk suits quite regularly. 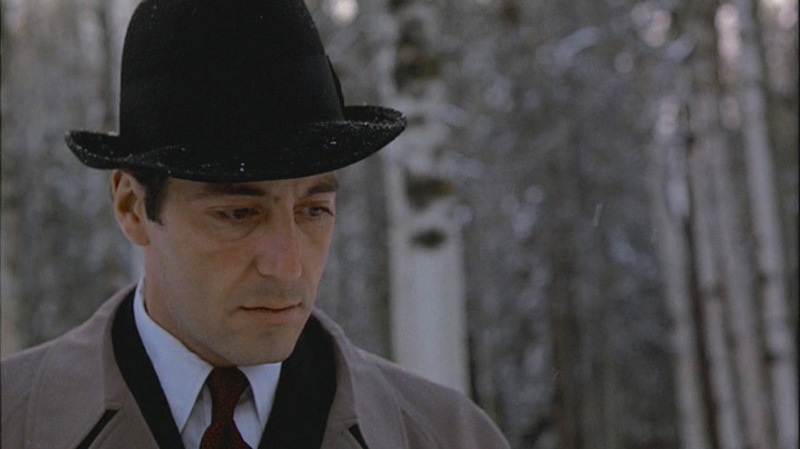 Infact , l do believe that ALL of Michael’s suits in The Godfather Part II are made from silk ( except the Tan check suit he wears in Miami and Cuba ). What do you think ? Good find! 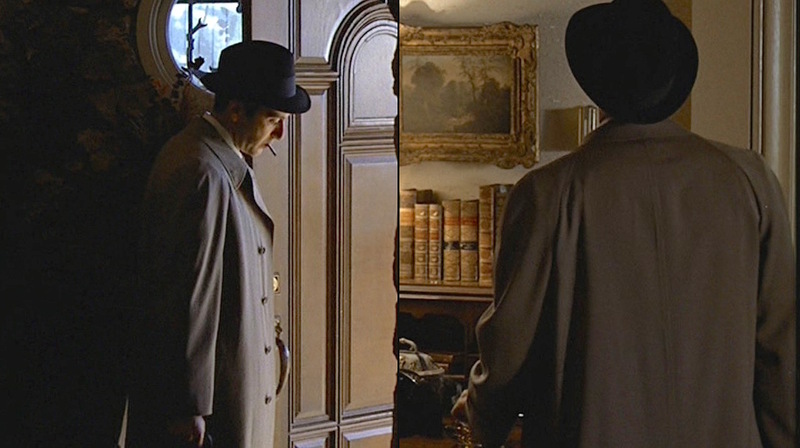 It’s certainly possible, and the sheen resembles shantung.. plus the anecdotal evidence of the “silk suits” dialogue you mentioned. Would you be able to send me a link to the auction listing you found? Thanks, and much appreciated! Hi, is it still “acceptable” to wear a black three piece suit as business attire, and can you still wear a waistcoat that is as high as the one above? I believe the general consensus about black suits remains that they’re still not quite “acceptable”, although I’m sure the only real issues would arise in the most formal of industries: banking, law, etc. If one is compelled to wear a black suit in a business setting, I would recommend finding one with a pattern; pinstripes would be best, but even a tonal herringbone weave could work. Regarding the waistcoat, I personally prefer the higher look that was characteristic of the “golden age of menswear” from the 1930s-1950s. Different fits are flattering for different folks, however, and this would be a good place for you to experiment and see what type of waistcoat you’re most familiar with. For a semi-“acceptable” black business suit with a high waistcoat, I would recommend that you check out the black herringbone three-piece suit worn by Daniel Craig in the latest James Bond film Spectre. He still wears it in a non-[legit] business setting of a Mafia funeral, but it’s still slightly more appropriate for the board room than a solid black. I hope this was helpful to some degree! This was so helpful, all I wanted to know!